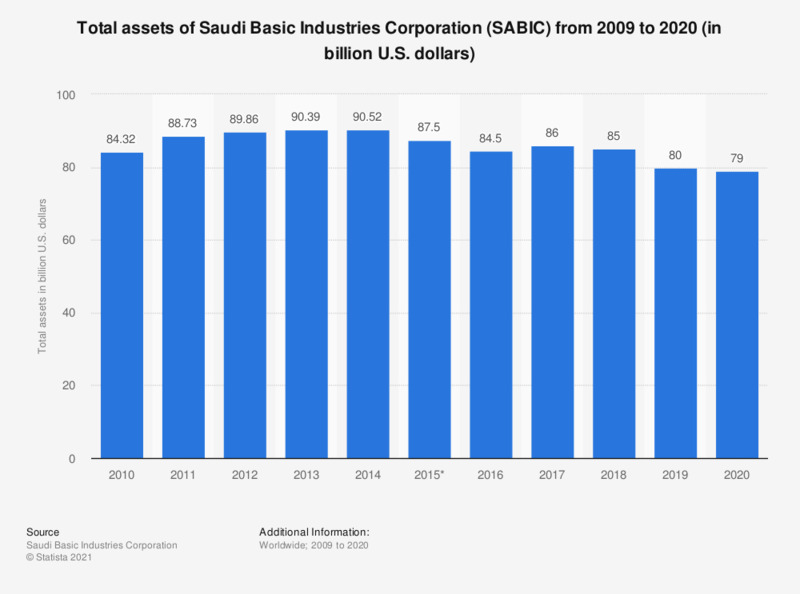 This statistic shows the total assets of Saudi Basic Industries Corporation (SABIC) from 2009 to 2017. Saudi Basic Industries is one of the largest diversified chemical companies worldwide, and is headquartered in Riyadh, Saudi Arabia. It is the largest public company in that country. In 2017, SABIC had total assets of approximately 86 billion U.S. dollars. * 2015 figure given as 87.5 billion U.S. dollars in the report. All figures prior to 2015 are based on the exchange rate (Saudi Riyal to U.S. dollars) as of December 31 of each respective year. Figures for 2009 to 2015 were taken from previous SABIC reports.